Summary: The H1Z1 Hack is the best zombie game on the internet right now. If you love any type of MMO zombie games this is the big winner. Over 40 options with the cheat and amazing features to help win every round. Why Should You Use H1Z1 Hacks? H1Z1 is the fastest growing MMO zombie game in the world right now. 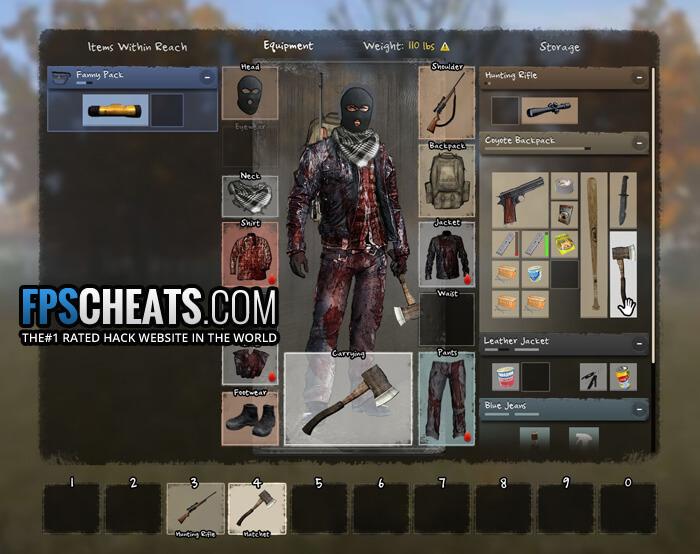 Our H1Z1 Cheats help you to see every player, zombie, animal, vehicle, weapon, ammo, and item inside the servers. Meaning you can instantly find what you want or need instead of roaming around the maps for hours. You can download H1Z1 on the main site. After just two hours of gameplay, I found over 20 weapons and enough ammo and items to stockpile my 2015 apocalypse bunker. 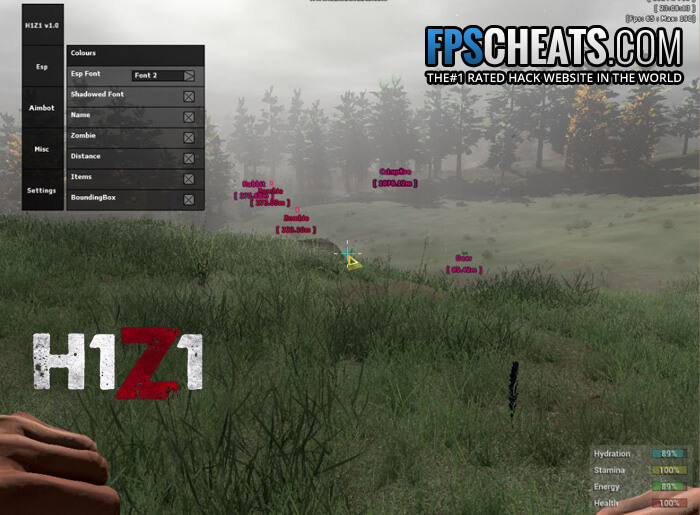 Check out the H1Z1 hack video below showing off a few of the features. As you can see in the screenshot below we highlight every item on the screen so you can find what you want fast. One of my friends who doesn’t believe in using hacks spent two hours searching for a gun, it took him that long to find something, who wants to do that? The other killer thing about FPSCheats is we will keep adding more features to the H1Z1 hacks daily and updating it for you, at no additional charge. Every patch update and feature update is 100% free to you. 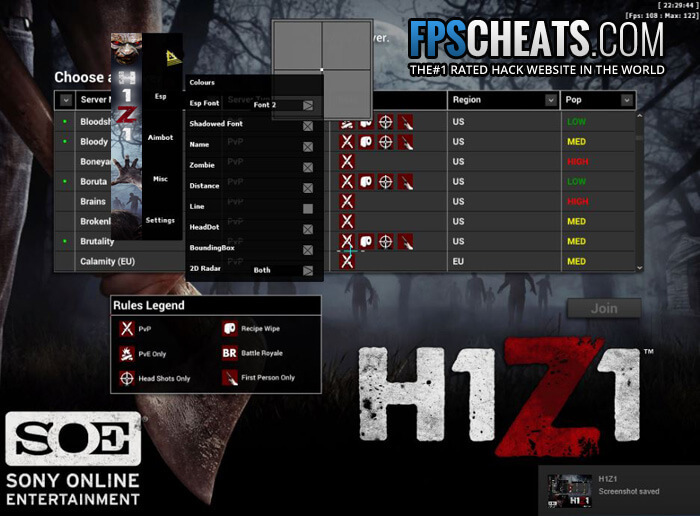 What Kind of Features Does the H1Z1 Hacks Have and How Will it Help? We are working on about 40 different features for the H1Z1 hack, and this is a basic list of some of the best features. The H1Z1 Aimbot allows you to select any button or mouse to activate the bot. Simple press that button and the Aimbot locks onto the enemy head, body or limbs (you specify which part). Once the Aimbot locks on the enemy player can jump, run, duck or go prone, and the pit stays locked on no matter what. Then simply push the fire key and take out the person or zombie. The wallhack included allows you see the enemy, even behind walls. As soon as the thing you’re locked onto dies the bot will immediately switch to the next living target. Basically the bot can take out 10 people in 10 seconds, it’s that good. If you get bored or just want some beer and pizza go ahead and turn on the auto-fire bot. Turing on the auto-fire allows you to go AFK (Away From Keyboard) and do whatever you want. The bot will stay in one place and kill everyone that gets close to you. The ESP makes it so you can always see everything on the map at all times. It doesn’t matter if you have a bird in the tree or some player hiding behind three buildings, you can see them! ESP works by placing a box on each player and item. We also list in words what each item is so you know where to go and what to go after. The worst thing that happens is when you download another H1Z1 hacks or cheats and get banned five minutes later. Most free cheats and even other VIP sites don’t have the expertise we do with coding hacks. Our coder has special protection in the cheat loader to keep you safe and unbanned. Not hack website has remained undetected longer than FPSCheats. We don’t just stop with the H1Z1 Hack basics; we want to load you up with everything we can. Currently, the coder is working on things like a fly hack so you can fly around the map, speed hack so you can run super fast and even no clip so you can go through walls. As I said earlier, we will add all these H1Z1 cheat features to the hack as soon as we get them done, sometimes we update three or more times a day! How Do You Download the H1Z1 Hack? It takes about two minutes to get setup with the hack, let me show you how to sign up. How Do I Know I Can Trust a Cheat Site? FPSCheats has been online for over eight years, and we have more than 500,000 members. You can also read other VIP member reviews in our Forum before you sign up. You’ll also notice we don’t have advertisements and banners or surveys all over the place. Most of the time, those type of sites are simply after clicks to make add money. What’s So Fun About H1Z1 Hacks? Think about playing on huge maps where you can explore forever, that’s what H1Z1 offers. The other amazing ting the development team is working on is the ability to have 1000 or more players on one server. You also can build homes, towns and more, so the game play is always changing. Once you explore maps for a while you can find all kinds of clothing and dress up your character in tons of different ways. During a match, when you encounter zombies they look really scary and act more zombie-like than zombies in DayZ or Infestation. Most people start off playing without H1Z1 hacks or aimbots. Then they encounter someone using an Aimbot, and they die instantly. When you die the other player takes all your loot, then after it happens a few more times you simply want to hack yourself. When you start using the H1Z1 hack, it makes the game more fun. You instantly become almost like a superhero, and you have 40 more features to use than the other players. So give our H1Z1 hacks a try and see how we can make the game more fun for you.